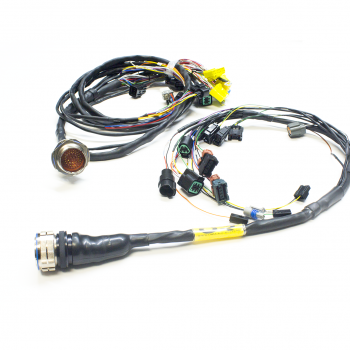 This stage 1 engine harness utilizes a firewall booth and metal plate for installation, and is covered on Techflex expandable braided tube for abrasion protection. This stage 2 engine harness utilizes a firewall boot and a metal plate for installation as-well, but utilizes Raychem DR-25 for protection which protects the harness from any solvents. Stage 3 option comes with a Amphenol Nickel plated quick disconnect round connector, gold plated pins, sensor labels & Raychem DR-25 protection.